Welcome! We aim to have a range of services for everyone to be enabled to worship God and find out more of his transforming love and purpose for all our daily lives. So we pray that you will find insight; encouragement, refreshment and inspiration in the Good News of Jesus Christ. With an “evangelical” ministry we meet together to open up God’s word to us in the Bible and meet around the Lord’s Table as we share in Holy Communion. A modern English service of Holy Communion as a reflective start to Sunday. Join us on Sunday's. It's free* and it's in St Peter's Centre (next to the church.) Just come along between 9.45 and 10.15 for this buffet-style breakfast. It’s a great place to meet up before the 10.30am service or after the 9am one. 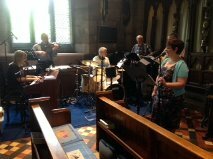 Our 10.30 Sunday Worship is of modern informal style,with variety from week to week, with music group led songs – and with some of the great “classic” hymns. We welcome those for whom church is unfamiliar or simply seems a closed door. The Bible reading and talk usually follow a series covering the basics of knowing and following Jesus Christ – and that gets us into the amazing depth of love God has for us all to share. Once a month at 10.30 we celebrate Holy Communion. On the first Sunday of the month the 10.30am service is “all age” and on other weeks we run separate activities (which follow breakfast in the St Peter’s Centre) for 4 to 14 year olds with them sharing in the end of the service in church. It’s great for our children to learn about how to follow Jesus. We welcome children throughout all our services including the opportunity for parents to be with younger children in “Barney’s Corner”. The church has a toilet and nappy changing facility. The 6pm service is a more traditional style with a choir. We have modern English services on the first and third Sundays of the month and the Book of Common Prayer on the second and fourth. Holy Communion is celebrated on the third Sunday. Every Wednesday there is a service of Holy Communion. The service will either be hosted at St Peter's or St Andrew's as a joint service or there will be separate services at the same time at both services. The service is either taken from the book of common prayer or common worship. There is a warm welcome offered to all. There is an increasing congregation for this service and about twenty people will attend at any given week. Coffee and biscuits are served after the service and people always enjoy a chat.